Reside in Old City Philadelphia and expect a luxurious stay at Renaissance Philadelphia Downtown Hotel. 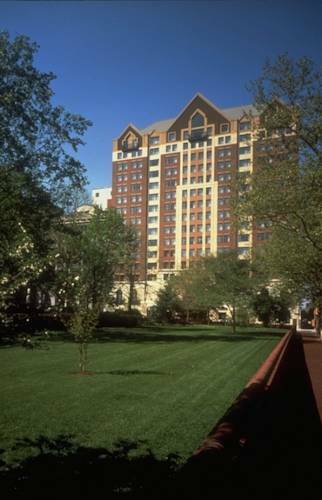 Complete with a central location, our hotel provides easy access to a variety of destinations including Franklin Square and Philadelphia Convention Center. Step into history as you visit Independence National Historical Park, home to the Liberty Bell and Independence Hall. After a busy day, retire to our rooms where plush beds with lush linens and fluffy pillows await. Entertainment is at your finger tips thanks to our 42-inch flat-panel TVs and complimentary high-speed Wi-Fi. Busy guests will appreciate our workstations with comfortable chairs boasting views of our Center City surroundings. From the French-inspired Chez Ben to the edgy and cool M.Brown's, our restaurants serve up an unforgettable meal morning, noon and night. Maintain your workout routine from our 24-hour fitness center or our indoor pool. Whether working hard or playing hard, Renaissance Philadelphia Downtown Hotel has you covered. Chez Ben: Chez Ben is a contemporary, upmarket French Brasserie known for bringing quality food to your table. Complete with a cafe counter with quality coffees, fresh juices and buttery pastries, our restaurant offers you a delicious and convenient experience. M.Brown's: Dine with us at M. Brown's and enjoy signature libations paired with a filling meal, expertly crafted to leave you satisfied. Stylish, relaxed and hosting an upbeat edge in Old Town Philadelphia, this is the perfect place to unwind.